The days of the dedicated off-roader 4x4 appear to be numbered. Land Rover no longer makes its dependable Defender, and the Toyota Land Cruiser has morphed over the years into a doorless rough-and-ready terrain conqueror into a considerably more upmarket beast. As a result, the Jeep Wrangler appears to be in a class of its own, with no real competition from any other car brand. Even if there were a myriad hypothetical rivals, though, the Jeep Wrangler would likely emerge on top as the must-have car for those who are truly serious about their off-roading. You don’t buy a Wrangler for luxury, do you? If you absolutely despise hard, scratchy plastics, then you really won’t enjoy your time in the Jeep Wrangler. Though Jeep has made the interiors of every other car it makes distinctly high end and superior to what came before, the Wrangler is the exception to that rule. Whilst everything appears to be well put together, the quality of the materials used in the Jeep Wrangler aren’t perhaps what you’d expect from a car costing $24,000. If you absolutely despise hard, scratchy plastics, then you really won’t enjoy your time in the Jeep Wrangler. Folk who plan on spending longer drives in the Jeep Wrangler probably won’t enjoy the car much, either. Admittedly, the front and back seats aren’t too uncomfortable, and there is decent head and leg room all around, but we don’t fine the chairs in the Jeep Wrangler to be particularly supportive and cossetting – even by rough-and-ready off-roader standards. The more modern touches on the Jeep Wrangler also aren’t quite up to what we’d expect from a car at this pricepoint, with the fiddly (and optional) touchscreen interface being the most obvious area for criticism. However, it is worth pointing out that the rest of the controls are much easier to operate on the move, courtesy of the big and chunky rotary dials on the center console. And we’re quite satisfied with the 31 cubic inch trunk space. Overall space is also pretty good. Along with the aforementioned head and leg room, the Jeep Wrangler also has lots of decent-sized cubby areas (ranging from netted pockets to the deep storage spot underneath the center arm rest), and we’re quite satisfied with the 31 cubic inch trunk space – especially when the Wrangler’s boxy dimensions means the available cargo area is very usable and versatile. Better still, the rear seats can be folded almost completely flat (though only if you remove the center seat’s head rest first), extending said cargo bay to over 70 cubic feet. The only downside we have with the trunk, in fact, is that the bottom half of the tailgate folds outwards, thus making it potentially tricky to load the vehicle up in tighter parking spots. You also have to open the bottom half before raising the glass top half up, so you can’t place items in the trunk whilst leaving the lower half in place like you can in a Toyota Land Cruiser or Land Rover Range Rover. Terrific off-road. Quite rubbish on it. The vague steering also means it’s not especially easy to initially place the vehicle where you want. We won’t beat around the bush with this one: if you’ll only rarely be taking the Jeep Wrangler off-road, then you’re seriously going to hate almost every second you spend driving the vehicle on a day-to-day basis. Overall refinement levels aren’t that great, for instance, with the bluff bodywork resulting in a noticeable amount of wind noise, and the soft suspension does result in plenty of body lean when cornering and a fair bit of bobbing over undulating sections of asphalt. 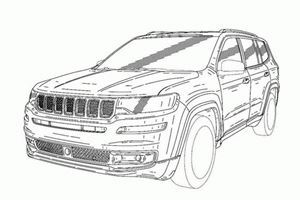 The vague steering also means it’s not especially easy to initially place the vehicle where you want, though those same chunky panels that generate a lot of wind noise at speed do at least give you a decent reference point – in spite of the chunky posts that do result in a fair few blind spots. Mercifully, the Jeep Wrangler has far more superior qualities when you take it off the asphalt. That softer suspension means lumps and bumps in the terrain don’t rock the vehicle to pieces, with one of the positive trade-offs for having lots of suspension travel being a high ground clearance. Having chunky tires also means a decent amount of traction is available on slipperier surfaces, and those bluff body panels we’ve mentioned twice already in the segment also allows some pretty impressive approach and departure angles of 42 degrees and 32 degrees respectively – thus allowing the Jeep Wrangler to claw its way up and down some pretty steep inclines and descents. Official EPA figures state the Jeep Wrangler can only return 17mpg in the city. Though other markets do get additional engines to choose from in their Jeep Wranglers (the Brits, for instance, have a pretty torquey diesel available to them), the United States territory is only supplied with a sole offering: a 3.6-liter six-cylinder gasoline engine. Even by the standards of the class, that’s a pretty big engine, and – as a result – it isn’t especially economical. Official EPA figures state the Jeep Wrangler can only return 17mpg in the city, with only a marginal improvement in the highway tests courtesy of a 21mpg figure for models fitted with the standard equipment six-speed manual (the optional five-speed automatic drops the highway by one mile-per-gallon. Granted, you do get a bit more control with the six-speed manual. 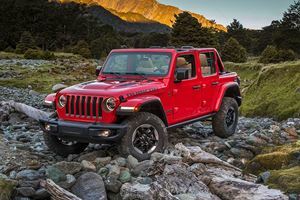 Still, the engine itself is a fairly refined one, with a smooth power delivery that’s just as useful when driving on the asphalt as it is when you’re hustling a Jeep Wrangler across a rocky trail. Plus, with 285-hp and 260 lb-ft of torque to play with, there’s likely very little in the United States that can stop a Jeep Wrangler in its tracks. Both transmissions work really well on the Jeep Wrangler, too, with the automatic in particular making it particularly easy to just focus on what’s ahead of you. Granted, you do get a bit more control with the six-speed manual, but that is offset a bit by the fact it’s a little bit awkward to use for prolonged periods of time. 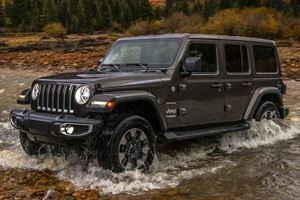 Yes, that’ll probably be more noticeable when driving on public roads, and those who prefer being more connected to the driving experience will undoubtedly feel the manual is worth sticking with, but it is something we reckon is at least worth considering if you’re looking at buying a Jeep Wrangler. Considering how sparsely equipped the Jeep Wrangler is, you’ll need to fork out. The Jeep Wrangler may be one of the more affordable dedicated off-roaders on the market, but that doesn’t mean we’re not disappointed with the standard equipment levels on the car. Base spec ‘Sport’ cars don’t even come with power locks, electric windows or air conditioning as standard, and you’ll need to spend north of $30,000 on one at least in order to nab yourself a Jeep Wrangler with all of those features without consulting the options list. Heck, not people who spend at least $40,000 on the flagship Rubicon Hard Rock model will still need to fork out another $1,195 just to get a built-in satellite navigation system. Considering how sparsely equipped the Jeep Wrangler is, you’ll need to fork out at least £30,000 for the Sahara spec if you want standard-fit air-con and power locks to be available with the ability to add on satellite navigation, climate control and vehicle tracking as optional extras. One optional extra we would suggest you heavily consider, though, is the ‘Unlimited’ body style. With a starting price of nearly $28,000, it’s substantially more expensive than the two-door Jeep Wrangler, but that does mean you have a far more practical car that’s suited to buyers who regularly ferry people about in their vehicles. Of course, if the back seats will only be used infrequently, then the regular two-door car makes more sense. Regardless of which model you go for, your Jeep Wrangler should hold onto its value fairly well (it’s one of the benefits of having a car with a relatively niche yet devoted following). Plus, if there isn’t anything in the official options list that catches your eye, there are a whole load of aftermarket options available for the Jeep Wrangler – though do make sure they don’t invalidate the manufacturer’s warranty before installing them on your off-roader. Speaking of warranties, the Jeep Wrangler comes with a fairly standard three-years/36,000-miles bumper-to-bumper warranty, and a separate five-years/60,000-miles one for the powertrain. Reliability issues haven’t’ been big concerns for the Jeep Wrangler, so it’s safe to say it’s a fairly sturdy and dependable car. 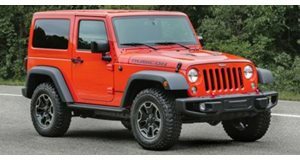 You can now spec out the new Wrangler using Jeep's online configurator. Anyone really think this will harm sales? No way. These images come from China, of all places.